Click to get to our public forum. How wonderful that this year the start of the Feast of Tabernacles (October 3) coincides with the Mid-Autumn Festival that the Chinese are celebrating. The date falls on the full moon of the seventh month in the Jewish calendar and the full moon of the eighth month for the Chinese lunar calendar. Today is bikhat hachama. The day when observant Jews bless the sun. Purim—which will be celebrated tomorrow—is a wonderful reminder of the sovereignty of God and an appropriate feast to be observed and understood in these difficult times. 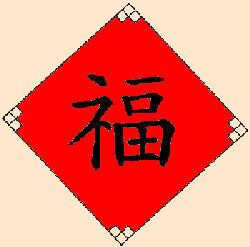 The character “fu” stands for happiness and good fortune, something much desired by the Chinese, not only during Chinese New Year but all year round. From a Christian perspective, “fu” is also something to be grasped. It links-up with other characters to mean bless (zhu-fu), blessedness (fu-ze), good news and gospel (fu-yin), and evangelism (fu-yin zhu-yi). In the Beatitudes, the character (you-fu-le) appears nine times and means blessed is. Its radical on the left is the God or Spirit radical, and on the right, there is a one or first, a mouth (which represents a person), and a field or garden. God alone with the first man (Adam) in a garden (Eden) is certainly a good way to depict happiness. In the Book of Revelations, eternal blessing is promised when God Himself will dwell with His people in the new Jerusalem "laid out like a square" (garden). There will be true happiness—no more tears, death, mourning, crying or pain. The first man was alone with God soon after he was created. And the "last Adam"—Jesus Christ—in His last few hours as Man, was also alone with God in another garden, in Gethsemane. Although this was His most sorrowful moment, Jesus needed time alone with His Father. It prepared Him to die for us and set us free spiritually. Happiness is found in seeking and being with the Lord, whatever our circumstances may be. In Jeremiah 29, the Lord said: "You will seek Me and find Me when you seek Me with all your heart." That is the heart of God: He is our Father; He longs for us to seek Him and to know Him. The best way of doing this is by spending time alone with Him, in our spiritual garden. That is the greatest place of blessedness. May the New Year bring you this blessing and happiness in your fellowship with the Lord. May I share my observations about Chinese New Year with you? These came to me some years ago, right in the middle of Carlisle, PA, when I was talking about Spring Festival observance with my American sisters. I saw some things in these traditions I had never considered before. I found it thrilling that Chinese New Year and Passover shared a few things in common. They are both spring festivals, and both mark the beginning of the calendar year through lunar calculations. It is very important for the Chinese traditionally to clean our houses before New Year. It is called “Spring Cleaning.” New Year Day gives us the chance to start anew. Families bustle and clean and then no more cleaning is allowed on New Year’s Day. Is it something like the Jewish tradition of clearing the yeast out of the house? Many Chinese families place red banners over the top and sides of their main door to "ward off evil spirits." In Taiwan, they like to decorate their doors with seven-character couplets, gold characters over red strips. Why seven, the biblically perfect number? For the Jewish Passover, the blood of a lamb was applied to the top and posts of the main door so that the Angel of Death would "pass over" and spare the life of the firstborn. Why is red such an auspicious color for the Chinese anyway? Could it be because it is the color of blood, of redemption? Some Chinese anthropologists may well come up to me and give me some perfectly well researched reason for why these traditions are just so. But do you know what I think? I think, the Lord, being the Master Artist that He is, has left an indelible mark, His imprint, His signature, His legacy—call it what you like—in this culture, as He has probably done with many other cultures. I believe this because I know my God to be all-powerful, all-knowing, the ruler of ALL nations, and THE Creator of everything that is. One day, when the trumpets sound, and we are all “out of here”, we will meet Him face to face and finally see Him in His true light. Then He will tell us why these traditions are celebrated just so. In the past weeks, months, yes, even for this whole year, have any of you felt a sense of despair just watching what is happening around you? It is very interesting that on this week of Passover, the parashas reading of the Torah for the week deals with the Day of Atonement and so many issues that we believers are taught relating to the crucifixion and death of our Messiah. Tonight millions of Christians will be in vigil, remembering the pain, agony, grief and suffering of our beloved Savior.